He’s a the self-confessed former ‘ratbag’ jockey who has been the upset king of the WRA Country Championships Qualifiers. Jake Pracey-Holmes, 27, will be shooting for his third straight success in the $150,000 Qualifier at Dubbo on Sunday and if recent history is any guide he’s a chance no matter what he’s legged over in the 1400m race. “That’s what everyone else has been saying. I just ride a horse the way it needs to be ridden and if it wins it wins,’’ he said. It’s looking likely that Pracey-Holmes will be riding a local hope at generous odds come Sunday’s race as he’s committed to partner Sprezzatura for Clint Lundholm or, if that horse doesn’t gain a start, The Rouseabout for last year’s winning trainer Justin Stanley. 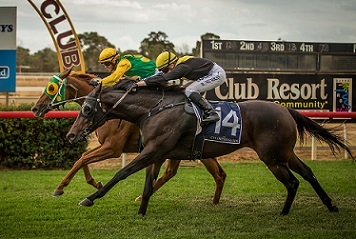 In 2017 the Gulgong-based jockey partnered the fairytale Bourke horse Stoneyrise, who was an outsider in early betting before starting $10, then backed it up last year with another upset on Good Host at $26. “The trainer (James Hatch) was more confident than me on Stoneyrise,’’ Pracey-Holmes said. “I was worried because he’d never been past 1200m, had no trial and was first-up at 1400m so it was a big ask. But he said he’ll get back, find the runs and if he’s good enough he’ll win and that’s what happened. It’s probably not a surprise that Pracey-Holmes doesn’t worry about what price his ride is in a race. He considers himself lucky just to be in the position he’s in with a partner, Liz, and two daughters and steady work riding the country circuit. While he has something of a racing pedigree, his grandmother Joan (Pracey) and grandfather Terry (Pracey) have been trainers, Jake grew up in Campbelltown away from a racing lifestyle. He wasn’t what you’d call a nice person as a teenager. “I should have been brought up in the racing game, I always said I wanted to be a jockey but I was always over in Campbelltown doing what everyone else did,’’ he said. “I was a ratbag when I was younger. I was mixing with the wrong crowd. I was doing stupid things, fighting and drinking. “I could either stay in Sydney and make nothing of myself or go to the bush and make something of myself. 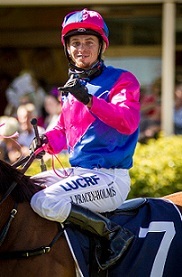 After starting out as an apprentice with Clarry Conners at Warwick Farm he made the move west at 18 to give himself the best chance of making a life for himself. Jake Pracey-Holmes wins the 2018 Country Championships Qualifier at Dubbo on Good Host (inside). (Pic: Janian McMillan/Sarsfield Thoroughbreds). He spent the bulk of his apprenticeship with Peter Nestor at Dubbo, though did return to Warwick Farm for a couple of years. It was during that time he met Liz and with their first child on the way headed back to the country. Pracey-Holmes, who sometimes sports a beard and is currently growing a mullet, enjoyed a career best season by winners, 51, in 2017-18 and is on the way to matching it this season. Sprezzatura, his likely ride in Sunday’s Qualifier, ran sixth in the race in 2018 but has managed just one placing in four starts since. The Rouseabout is in a similar boat, he was in good form in his first preparation for Justin Stanley but hasn’t fired in his three runs this year. But Pracey-Holmes thinks he knows how to coax the best out of that horse. “I had committed to Clint and Sprezzatura but my original pick was The Rouseabout,’’ he said. “I know his last two runs have been terrible, and so has Sprezzatura’s, but he’s always got back behind the pace and I reckon he is a natural leader. While his ride it is yet to be confirmed Pracey-Holmes is certain of the horse, and likely favourite, that all 14 runners will have to beat on Sunday. “If A Martin Placepick starts I think it just about wins it myself. I think he is a nice horse and the way he won the other day at Parkes with top weight he gets in well at set weight,’’ he said.